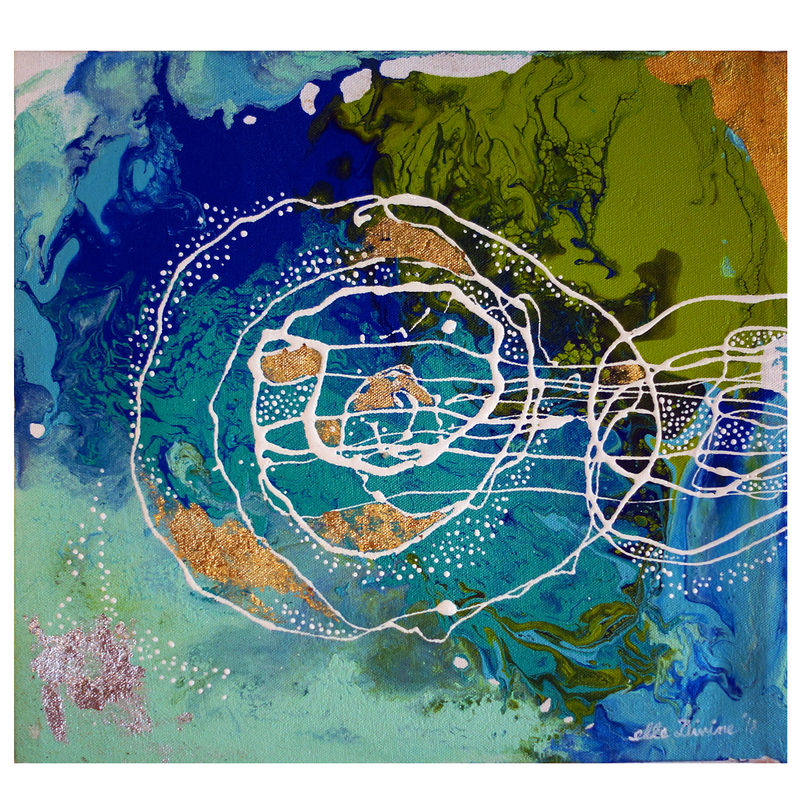 Sacred Ocean Sanctuary is a mystical call to reconnect our beingness to our deepest essential nature – as a conduit for the good, the sacred, and the beautiful. S.O.S. 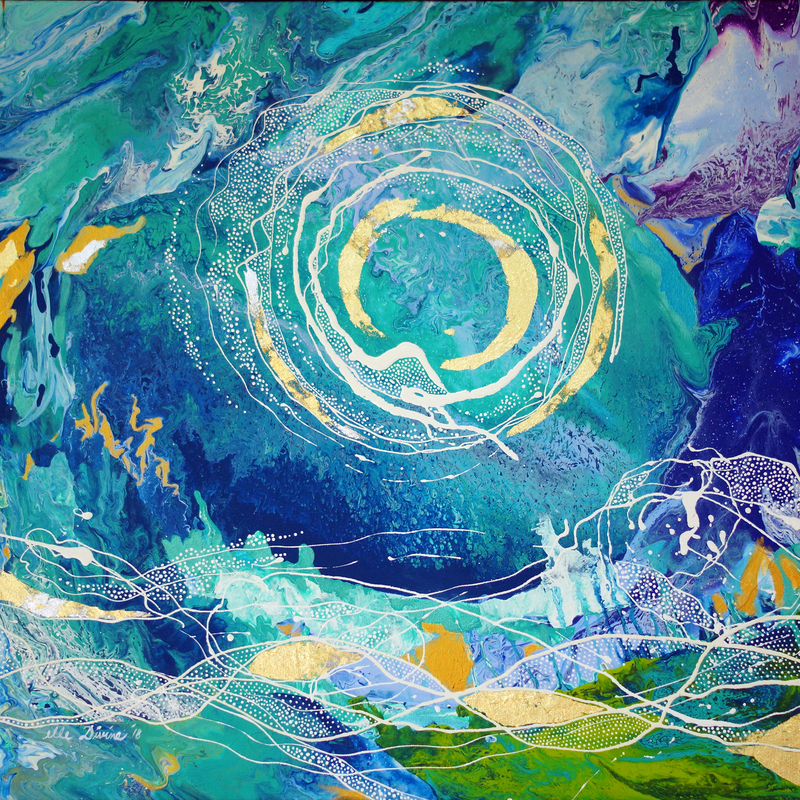 is where I channel through the energy field of loving-kindness and healing awakening for humanity’s consciousness to rekindle sacred connection with the ocean planet – with the intentions of my paintings to become visual medicines for the soul where one can connect in contemplative meditation to regain the light of peace and stillness within… and it is my prayer. Our local and global community has been deeply affected by waves of crisis inflicting the collective consiousness to fear. And our challenge is to co-create a counterforce to wash off the murkiness of it – and envelop our auric field with the sacred oceanic spirit. May we unite our pledge to protect our sacred ocean — for our fluid, liquid, salt body was once cradled by the womb of the Mother Ocean. All creation big or small are but part of the dots of constellation connected to the ocean. Let’s make our relationship with the ocean to be sacred. And nothing else. 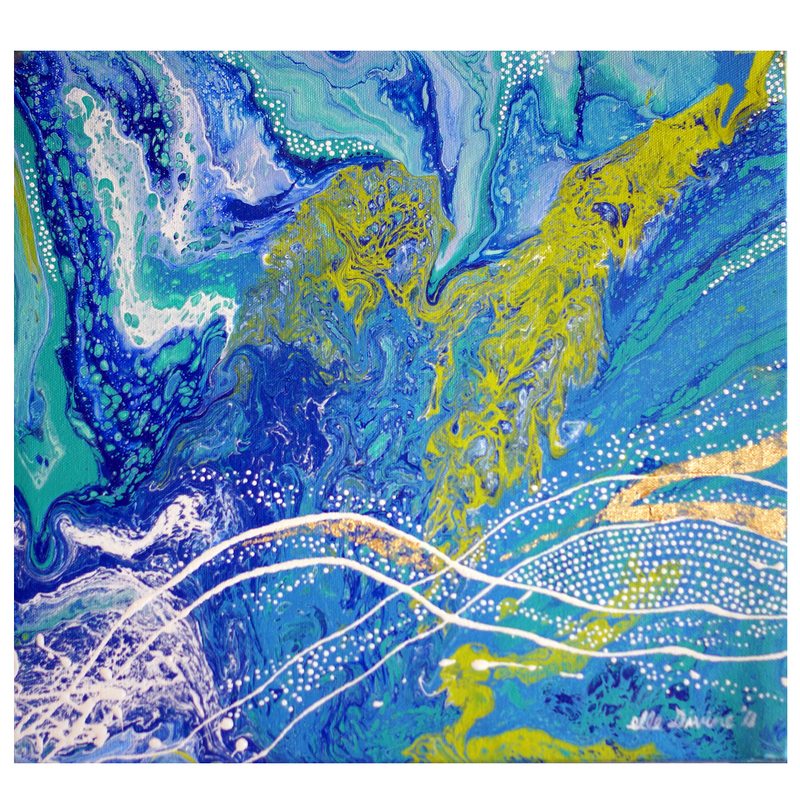 My paintings echo the power and the healing vibration of the ocean. And may it expand and awaken the consciousness of every living being… and it is my prayer. I am a drop of the ocean. As you are, too. We are One. Sulu Deep is an ocean filled with mystery – and a birthing place of treasures of the sea. Located in the southwestern area of the Philippines, separated from the West Philippine Sea in the northwest by Palawan. It cradles the Tubbataha Reef National Marine Park – one of the World Heritage Sites. 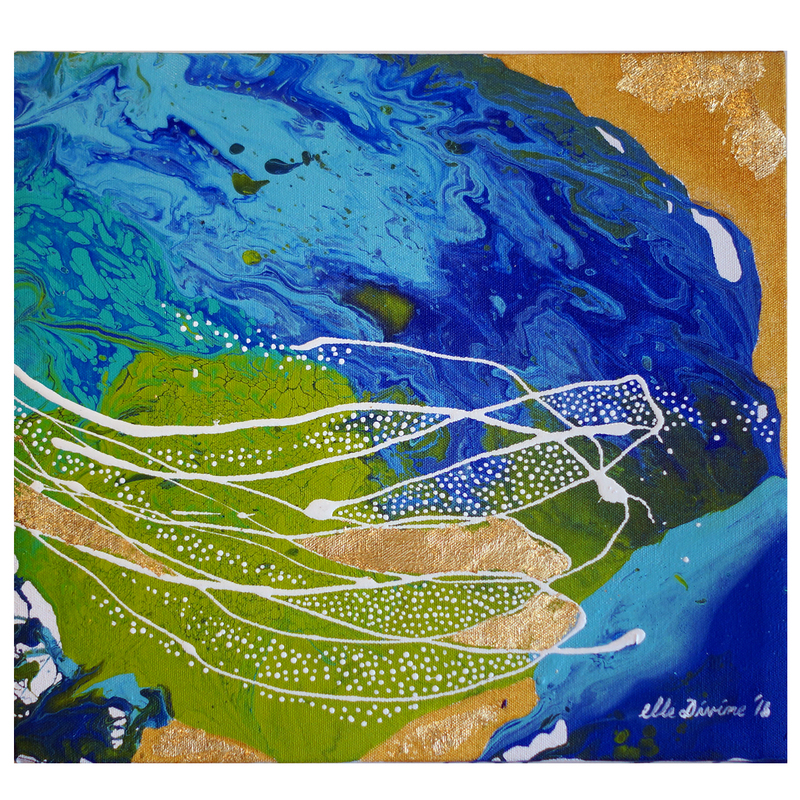 As I worked on this piece, I imagine swirling into the depths of the Sulu Sea and tune in to its energetic vibration – one of the sacred marine pockets of the planet. According to Star Trek, the character Hikaru Sulu is named after the Sulu Sea. “The vision for Sulu was to represent all of Asia,” according to actor George Takei. The reef constellation of Apo Island is ‘home to over 650 documented species of fish and where most of the Philippines’ 450 species of coral can be found’ and as such, its magnificence has become a dwelling place for diving – a hotspot for conservation within the Coral Triangle and where community-based marine protection began. I visited Apo Island together with my sisters in the Skinni Tribe. It was a brief encounter of Her energy; and what struck me most was experiencing a vibrating echo of the land resisting over-capacity of recreation. I had to question myself what it means… I wonder why. This painting answers the question. For the island inhabitants and dwellers to remember to always come into sacred connection with the sea. Legend has it that Magwayen, the Bisayan goddess of the Sea is “nurturing, calming, and a provider of abundant fish and seafoods, but is also known to be tempestuous when she gets angry”. She is also the entity that ferries the soul to transition in the afterlife from the living world. It’s totally a reflection of the sea with the emotions we feel as human beings. We are made of fluid, liquid salt of the sea… and it makes us resonate strongly with the ocean – where it can cleanse our body, auric field, and soul… and reclaim our tears for peace and healing. I align with the Feminine Divinity of the ocean… full of grace and raging beauty. 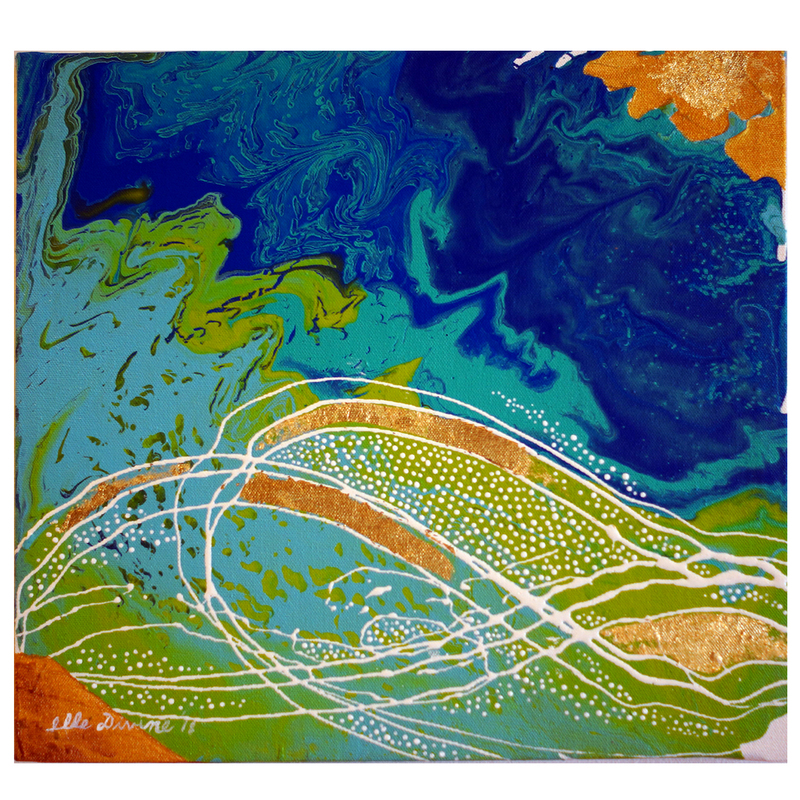 It influences the flow of my work… the splatter and swirl of the paints… the meditative state of dotting constellations of entity and igniting the spirit of the goddess of the Sea. See infinity beyond the horizon of the sea. There is an infinite, expansive freedom when we are by the edge of the sea looking ahead to the ever-distant space of the universe – the thin layer between the sky and the sea. Sacred Ocean Sanctuary is held in the infinite creative process of being a vessel to reinstate in the human consciousness and conscience the sacred value of the sea. 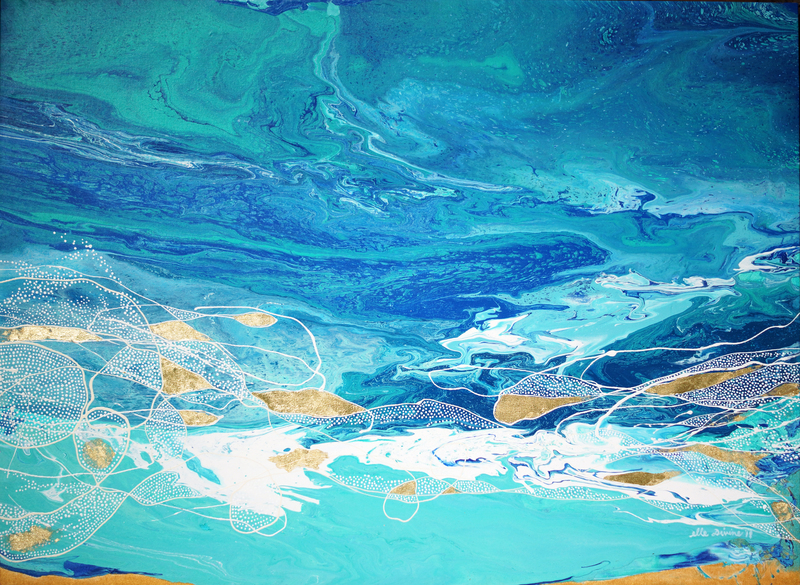 It is my intention that my artwork reminds us of the sacred beauty of the sea. We are never apart. We are One. Delphinus is a constellation in the celestial wonder of the night sky. In a way, it mirrors the lightness of being of these playful, intelligent, gentle creatures. As a “Spiritual Animal”, it represents “harmony and balance” with a deeper inner strength. They trust their instincts and intuition rather than overthinking; they also symbolize protection and pure, enlightened consciousness. 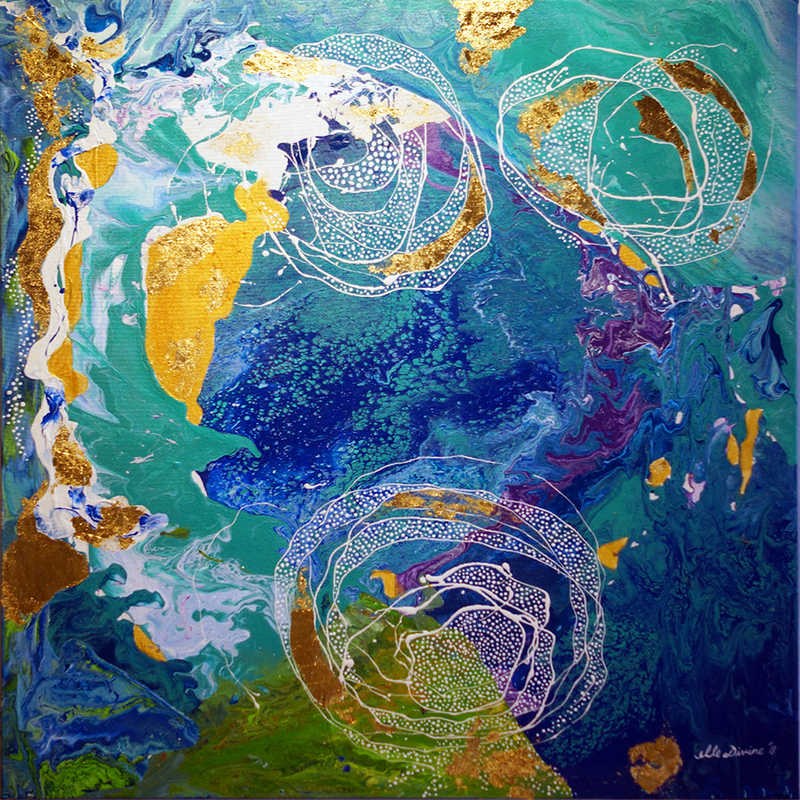 As I painted this work, I attuned to the higher realm of consciousness streaming along the echo of dolphin soundwaves that magnify harmony and balance all over the sacred ocean, all over the planet. From the sea and up to the celestial sphere, the dolphins remain a spirit guide for humans to connect. Lumba-lumba is Bisayan word for dolphins; and it is such a dynamic word because it literally means “swift race” – just as the dolphins race along the bow of the boat and gliding along the rolling wave being playful in the midst of things. These creatures have such healing qualities in them – the smile, the intelligence, and the pure innocence of freedom. 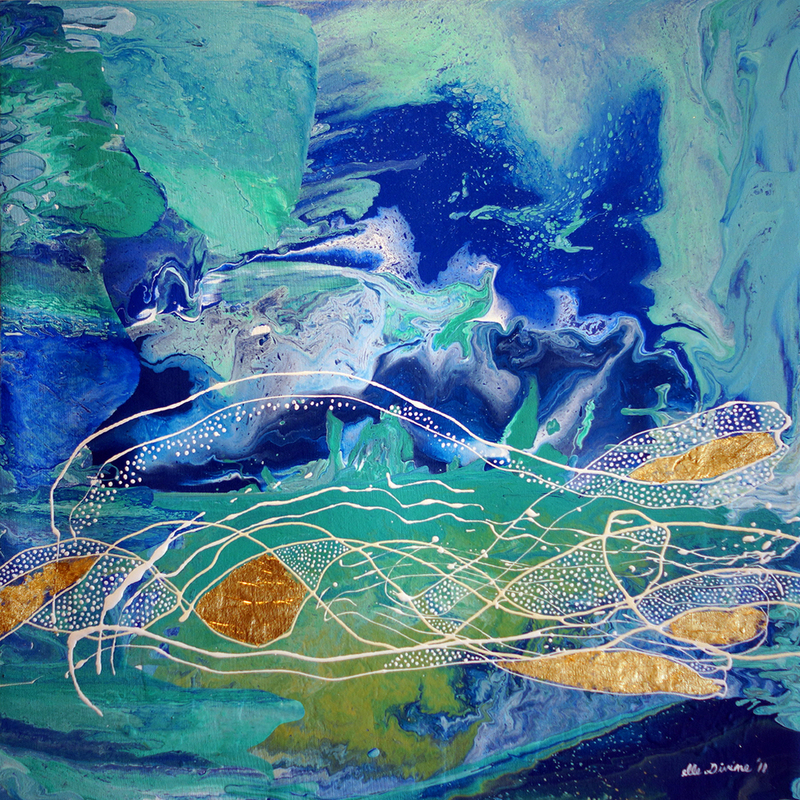 I paint freely and instinctively that somehow the figures of the racing dolphins appear on the canvas. I’m always surprised but it brings a smile to my face and pure joy all over my being. I breathe as the dolphins to align my Soul-Spirit. Tañon Strait is home to 11 known species of whales and dolphins. It is a protected seascape located between the island of Negros and Cebu; and connecting the Visayan Sea in the north to the Bohol Sea in the south. I remember swimming in its turquoise water at the sandbar in Manjuyod and feeling the embrace of both energies of the islands surrounding it. Knowing that it’s a playground for our marine mammal friends, I sensed that their joyful playfulness reverberates the healing power of the liquid salt of the strait. May we always stand with our marine mammal fellows. The Visayan Sea is a rich fishing ground – known for pelagic fisheries including the plentiful group of fishes like the herrings, mackerels, and sardines. And I heard of it as being a playground for thresher sharks. 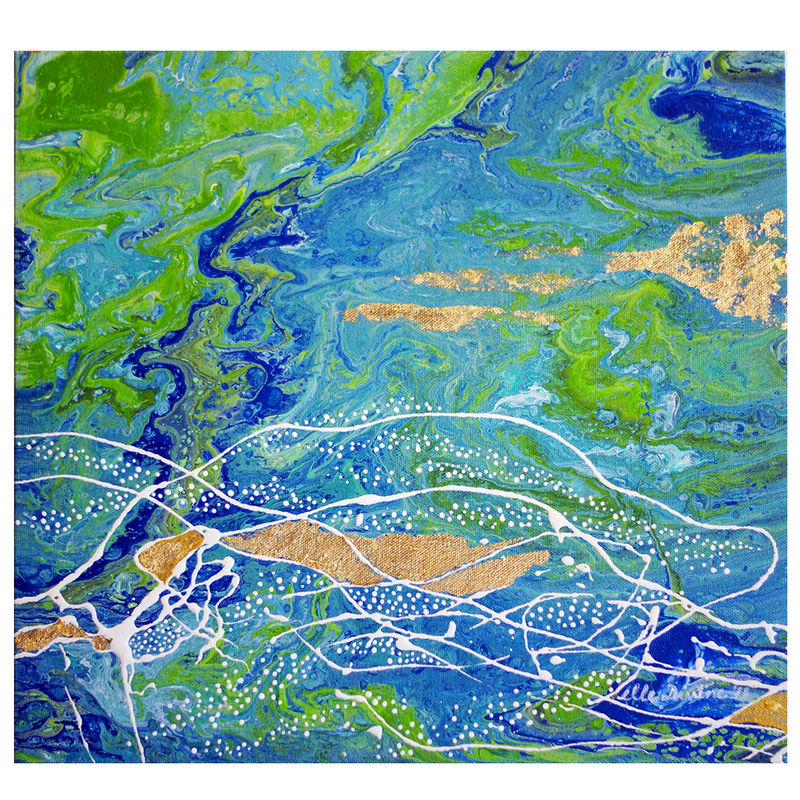 I may be a long way away painting this piece yet I hear the vibrational texture of the land and the sea – the whirling breeze, the lapping waves, foamy surf bubbles, swaying rustle of coconut leaves, and cheerful laughter of island children. And it’s all the more I wish everyone to advocate solid actions to protect this sacred and bountiful pocket. Count me in. 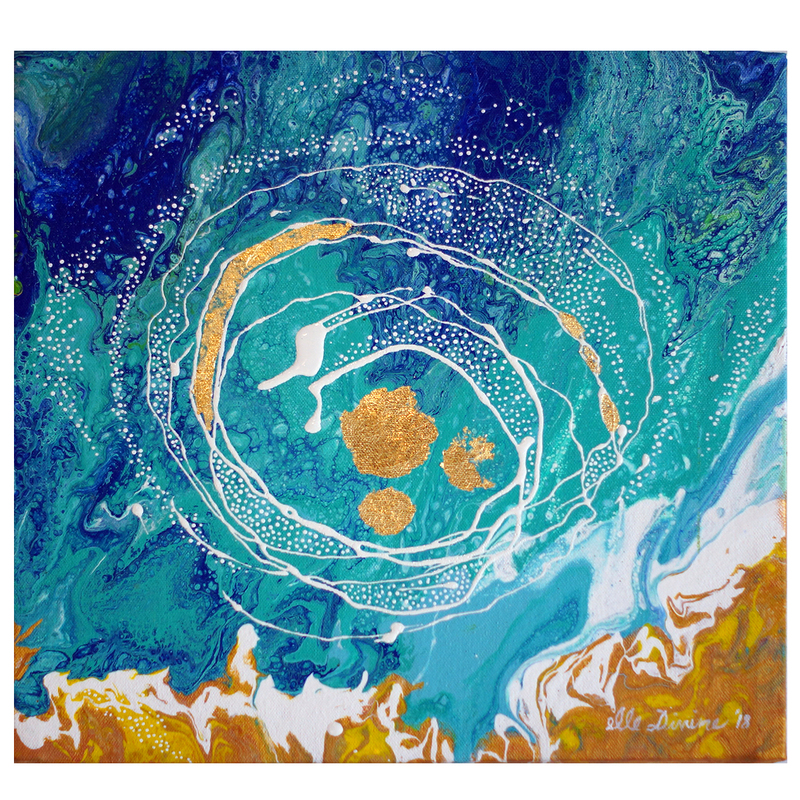 Inspired by one of the craters of the moon dubbed as “Sea of Tranquility”, this painting is centered with the Divine Feminine energy resonating from its mystical frequency. The lunar entity has strong affinity with the feminine energy considering how it affects the rhythm and the psyche of women. It also magnifies a strong gravitational effect with the sacred ocean. With the moon and ocean energy fused together, it can cradle emotional depth that is navigable through trust and surrender within one’s Higher Consciousness. This source of light illumination blends a perfect balance for the life of the Ocean Earth. The mystery within the depths of the deepest natural point on the Ocean planet indicates a depth in humility when one can humbly reflect on the magnificence of creation. Its magnanimous terrain is a sacred dwelling cathedral for anonymous creatures waiting to be discovered. It’s a living trench which pulsates the beating core of the earth. My painting is but a speck of the entirety of it and yet this work honors the great wonder. 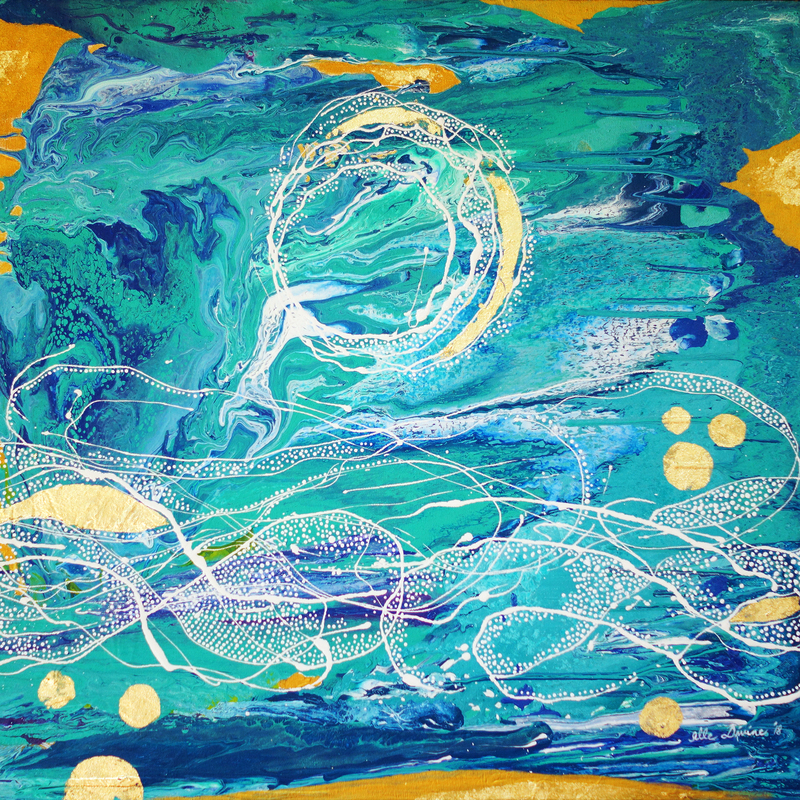 Its vibration ripples the strength and grace of the sacred ocean… and this work is but a spark of it. Living in the archipelagic country of the Philippines, each island is embraced by its pacific blue water. From the air, one can see the hues of blue that echoes the vibrancy of life in its tropical waters while stories of adventures and mysteries still remain in the treasure trove within the hearts of the Filipino people. Coming from the Australian shore, I lived life close to the coast and have witnessed the murmurings of the tidal flow which has influenced the immemorial cycle of the highs and the lows of life’s experience. And my life in the Philippines has brought a deeper discovery of how the sea is an important resource for life and livelihood for many; that when people dance in its rhythm and poetry, the sea opens its abundance; when people give sacred care to it, peace and harmony will triumph. As I was flowing in the mood of painting this piece, I felt the vastness of the Pacific – the expanse of the Philippine Rise and how it cradles the 7,107 island’s of this country. And each dot recalls the markings of gratitude of my creative journey thus far. Shipping cost not included. Paintings can be rolled for easy shipping.